Apple has released a Report on Government Information Requests. This report provides statistics on requests related to customer accounts as well as those related to specific devices. We have reported all the information we are legally allowed to share, and Apple will continue to advocate for greater transparency about the requests we receive. At the time of this report, the U.S. government does not allow Apple to disclose, except in broad ranges, the number of national security orders, the number of accounts affected by the orders, or whether content, such as emails, was disclosed. We strongly oppose this gag order, and Apple has made the case for relief from these restrictions in meetings and discussions with the White House, the U.S. Attorney General, congressional leaders, and the courts. Despite our extensive efforts in this area, we do not yet have an agreement that we feel adequately addresses our customers’ right to know how often and under what circumstances we provide data to law enforcement agencies. We believe that dialogue and advocacy are the most productive way to bring about a change in these policies, rather than filing a lawsuit against the U.S. government. Concurrent with the release of this report, we have filed an Amicus brief at the Foreign Intelligence Surveillance Court (FISA Court) in support of a group of cases requesting greater transparency. Later this year, we will file a second Amicus brief at the Ninth Circuit in support of a case seeking greater transparency with respect to National Security Letters. We feel strongly that the government should lift the gag order and permit companies to disclose complete and accurate numbers regarding FISA requests and National Security Letters. We will continue to aggressively pursue our ability to be more transparent. Like many companies, Apple receives requests from law enforcement agencies to provide customer information. As we have explained, any government agency demanding customer content from Apple must get a court order.¹ When we receive such a demand, our legal team carefully reviews the order. If there is any question about the legitimacy or scope of the court order, we challenge it. Only when we are satisfied that the court order is valid and appropriate do we deliver the narrowest possible set of information responsive to the request. Unlike many other companies dealing with requests for customer data from government agencies, Apple’s main business is not about collecting information. As a result, the vast majority of the requests we receive from law enforcement seek information about lost or stolen devices, and are logged as device requests. These types of requests frequently arise when our customers ask the police to assist them with a lost or stolen iPhone, or when law enforcement has recovered a shipment of stolen devices. Only a small fraction of the requests that Apple receives seek personal information related to an iTunes, iCloud, or Game Center account. Account-based requests generally involve account holders’ personal data and their use of an online service in which they have an expectation of privacy, such as government requests for customer identifying information, email, stored photographs, or other user content stored online. Apple logs these as account requests. We believe it is important to differentiate these categories and report them individually. Device requests and account requests involve very different types of data. Many of the device requests we receive are initiated by our own customers working together with law enforcement. Device requests never include national security–related requests. 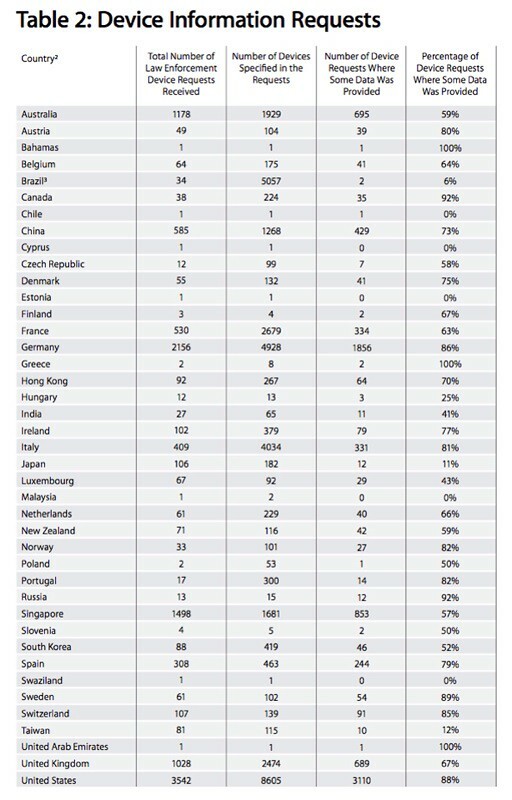 The following tables detail the account requests and device requests Apple received from law enforcement agencies between January 1, 2013, and June 30, 2013. 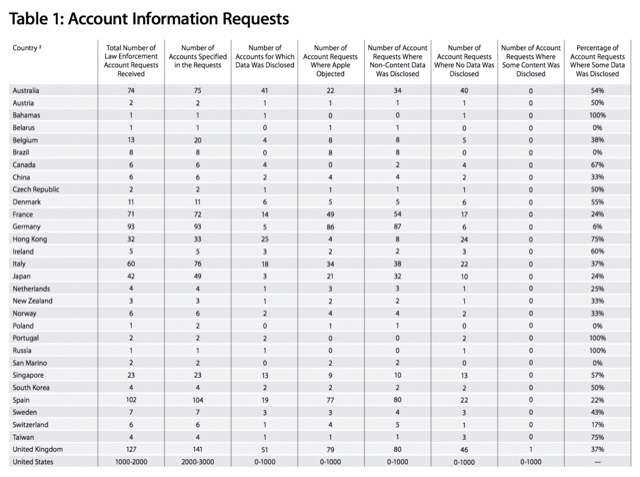 Table 1shows account requests. The U.S. government has given us permission to share only a limited amount of information about these orders, with the requirement that we combine national security orders with account-based law enforcement requests and report only a consolidated range in increments of 1000. The most common account requests involve robberies and other crimes or requests from law enforcement officers searching for missing persons or children, finding a kidnapping victim, or hoping to prevent a suicide. Responding to an account request usually involves providing information about an account holder’s iTunes or iCloud account, such as a name and an address. In very rare cases, we are asked to provide stored photos or email. We consider these requests very carefully and only provide account content in extremely limited circumstances. Table 2 shows device requests. Even though device requests have not been the focus of public debate, we are disclosing them to make our report as comprehensive as possible. These may include requests for the customer contact information provided to register a device with Apple or the date the device first used Apple services. We count devices based on the individual serial numbers related to an investigation.